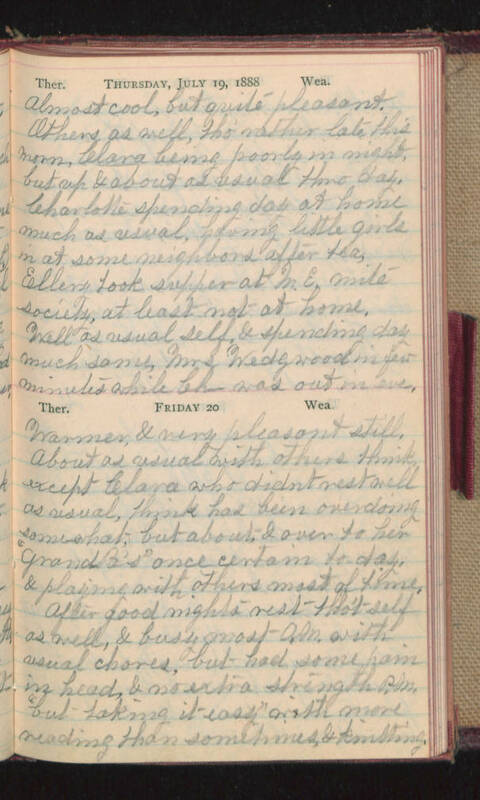 Thursday, July 19, 1888 Almost cool, but quite pleasant. Others as well, tho' rather late this morn. Clara being poorly in night, but up & about as usual thro' day. Charlotte spending day at home much as usual, having little girls in at some neighbors after tea, Ellery took supper at M. E. nite society, at least not at home. Well as usual self, & spending day much same, Mrs Wedgwood in few minutes while Ch- was out in eve. Friday 20 Warmer, & very pleasant still. About as usual with others think, except Clara who didn't rest well as usual, think has been overdoing somewhat, but about & over to her "grandpa's" once certain today, & playing with others most of time. After good nights rest tho't self as well, & busy most A.M. with usual chores, but had some pain in head, & no extra strength P.M. "but taking it easy" with more reading than sometimes & knitting.